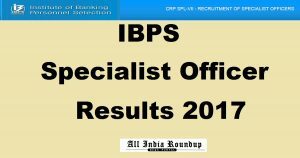 Institute of Banking Personnel Selection (IBPS) successfully conducted prelims examination for the recruitment of Specialist Officer (SO) posts on 31st December 2017. A huge number of eligible and interested candidates applied and appeared for the exam. All the candidates who had written the exam are eagerly waiting for the results. Now, the wait is over. IBPS is going to declare SO Prelims results today by evening. Candidates can check the results from the direct link provided below. Institute of Banking Personnel Selection (IBPS) is an autonomous agency in India, which started its operation in 1975 as Personnel Selection Services (PSS). In 1984, IBPS became an independent entity at the behest of Reserve Bank of India (RBI) and Public Sector Banks. IBPS CWE is now mandatory for anyone who seeks an employment in 20 public sector and Regional Rural banks. IBPS periodically accepts the exam applications from the candidates at their website, and the exams are organized at various locations in the country in online mode. This year it has released notification for the IBPS CRP SPL VII 2017 and the candidates who had written the exam can check the results from the official website. Institute of Banking Personnel Selection has released notification for the recruitment of candidates for various positions in the department. There are about 1,315 vacant positions for which the recruitment is announced. The vacancies are distributed as 120 posts of IT Officer (Scale I), 875 posts of Agricultural Field Officer (Scale I), 30 posts of Rajbhasha Adhikari (Scale I), 60 posts of Law Officer (Scale I), 35 posts of HR/ Personnel Officer (Scale I) and 195 posts of Marketing Officer (Scale I). Candidates who had written the exam can check the results from the direct link provided below. Click on IBPS SO Prelims Results. Stay tuned to this website. We will update SO Mains call letter, cutoff marks here. Press CTRL+D to bookmark this page for easy navigation.